For the Faculty Research Series, TMSL faculty and administrators and external guests present their current research. The Faculty Roundtable Series consist of smaller, interactive sessions for faculty (and, often times, students) to discuss teaching innovations or research strategies. Through the TMSL Quodlibet, pre-tenured faculty present their research and works-in-progress to the larger faculty for discussion and feedback. The New Scholars Writing Workshop aims to support new faculty (three or fewer years on the tenure-track and at the rank of assistant professor) with their scholarly research and writing projects through several initiatives. The workshop’s initiatives have included regularly scheduled seminars, opportunities for practice and feedback, and an assigned writing coach. And, as part of the TMSL Scholar-in-Residence program, TMSL invites renowned scholars to visit for approximately two days. During this time, the Scholar-in-Residence gives a formal presentation to faculty and students, interacts and dines with students and faculty and serves as a guest lecturer in one of our classes. Past Scholars-in-Residence include, for Fall 2015, Professor Wendy D. Greene, Cumberland School of Law Professor and Chair of AALS Section on Women in Legal Education, and for Spring 2016, Professor Catherine E. Smith, University of Denver Sturm College of Law Professor and Associate Dean of Institutional Diversity and Inclusiveness. Additionally, TMSL sponsors several faculty scholarly exchanges. One exchange is with South Texas College of Law (STCL). A second exchange is with law schools in the south central region. This exchange is called SCALS, which stands for South Central Association of Law Schools, and currently includes TMSL, St. Mary’s School of Law, Southern University School of Law, Memphis University School of Law, University of Arkansas (Little Rock), and University of Arkansas (Fayetteville). SCALS presentations focus on works-in-progress and approximately three faculty from each school present their research yearly at another participating school. Lastly, TMSL organizes a faculty exchange with Concordia Law School, through which one faculty member from each school gives a scholarly presentation each year. 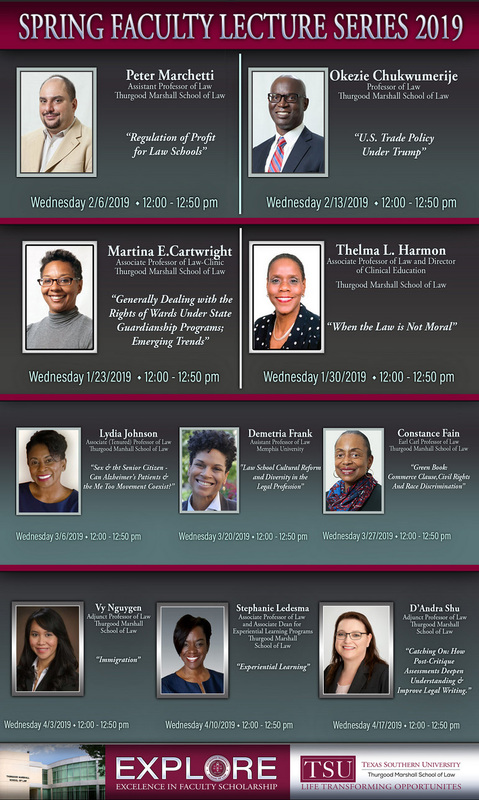 Lastly, the Interdisciplinary Bridges program is a new series where Texas Southern University faculty from other colleges or schools who research on topics related to law are invited to present their scholarship and projects. This new series presents additional opportunities for research and grant collaborations and allows faculty to view and discuss current legal issues through the lens of a different discipline. 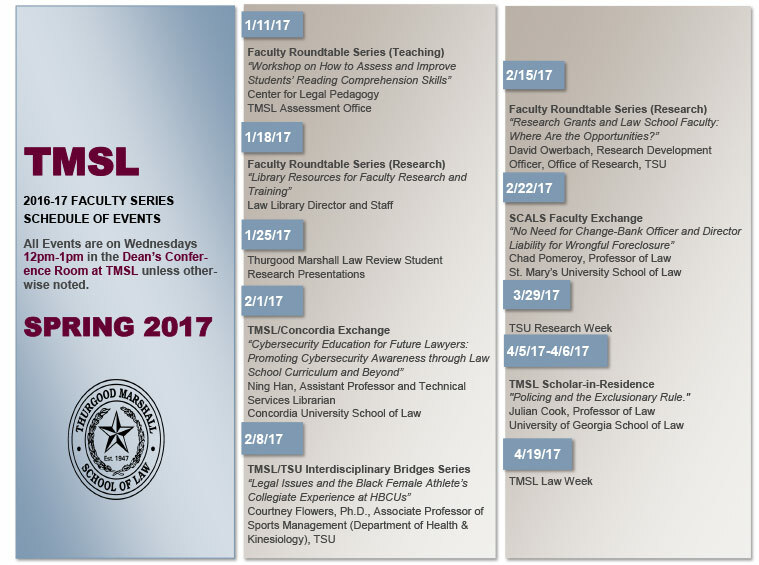 For additional information about the TMSL workshops and exchanges, please contact Cassandra L. Hill, Associate Dean for Research and Faculty Development, at 713.313.1190 or cahill@tmslaw.tsu.edu.